Five new, short videos about climate change at the Oregon coast produced by Oregon Sea Grant respond to the concerns of coastal residents. Those concerns, expressed through a 2008 survey of 300 coastal Oregonians, frame the topics of the videos: How do scientists predict climate change? 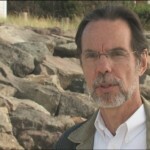 Shoreline Effects of Climate Change, Broader Coastal Ocean Effects, What is Government Doing? An Introduction video provides background on the set. The videos, hosted by Sea Grant climate change specialists, focus answers to Oregonians’ questions through interviews with experts, including scientists from NOAA and OSU and coastal planners. The producer of the climate videos is Joe Cone, assistant director of Oregon Sea Grant; editor is Stevon Roberts; the videos were supported in part by a grant from the NOAA Climate Program Office. Transcripts are available on the video pages.